Where Roots And Wings Entwine: Asda Baby and Toddler Event. Asda Baby and Toddler Event. As I like to save money where I can and always look for the best price when buying products I always take advantage of sales and events that offer discounts if they have on offer products I need to buy. Since I was pregnant one event I always see what they have on offer is Asda’s Baby and Toddler event. I have managed to save money and get some great deals buy shopping at Asda’s Baby and Toddler event over the last couple of years; first buying essential baby products and clothing whilst pregnant in preparation for the arrival of our baby and then buying products and clothing for little man as he has gone from a baby to a toddler. 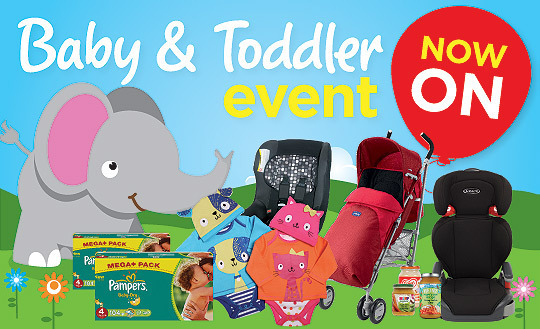 The Asda Baby and Toddler event is currently on right now and ends on the 5th of February. Once again I will be having a gander at the event seeing if there are any deals and discounts on offer for products that I could do with buying. During the event they have a vast range of products available on offer at great prices including well-known brands and Asda products. 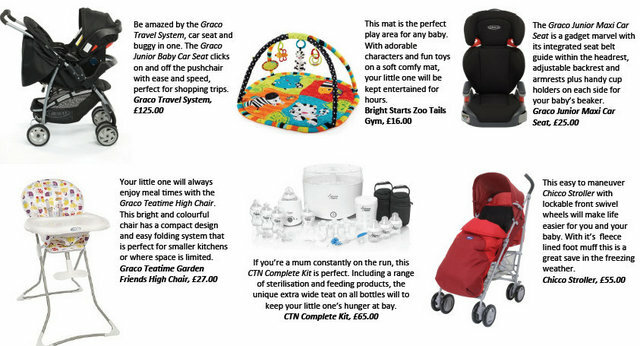 The range of travel related products available during the event includes travel cots, car seats, booster seats, carriers, pushchairs, strollers and travel systems. There is great savings available in this category, allowing parents-to-be and parents to save some money on big, essential baby and toddler items. During the event there are some great offers available on safety items including stair gates, safety playpen, thermometers and home safety kits. When we were safety proofing our home to help keep little man safe we purchased some Lindham safety gates which have been indispensable and even though the saving on offer at this event is only small, every penny saved helps. 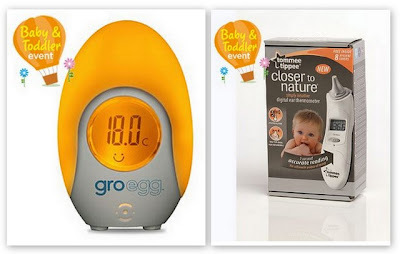 The Tommee Tippee Closer To Nature Digital Thermometer on offer at £20.00 instead of £30.00 is a great saving and if we did not already have a similar digital thermometer I would defiantly take advantage of this offer. I also love the look of the Gro Egg Colour Changing Thermometer which on offer for £15.00 instead of £19.98. Included in the feeding range of offers there are deals on bottles and sterilisers, highchairs, milk and weaning products. In the past we have saved money buying weaning related products including cutlery and drinking cups. During the event there are bath related products and toiletries, baby baths and bath seats on offer. I think the Munchkin White Hot Inflatable Duck Tub look fun and if and when we are blessed with another baby I will definitely get a fun inflatable duck to bathe our little bubba in. I hope to take advantage of the offer they have available on Munchkin Shampoo Rinser’s, now priced at £2.50 instead of £4.49 to make washing little man’s hair a little easier. There are lots of offers available on changing related products including wipes, nappies and potty training products. 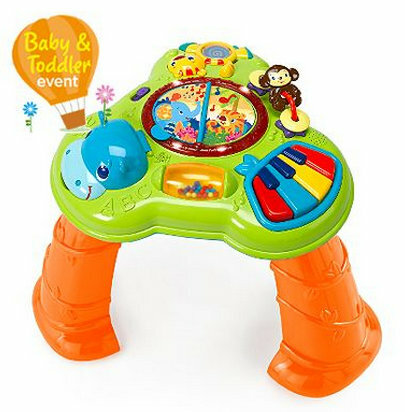 Available during the event there are many offers on play related products including walkers, bouncers, gyms and baby toys. I love the look of the Bright Starts Activity Table available for £22.00 instead of £34.97, and if we were blessed to be having another little one soon I would definitely get this as I think it is a brilliant offer on a fun, colourful activity table. There are some lovely items on offer perfect for the nursery including bedding, cots and mattresses, nursery accessories and nursery furniture. There is a vast range of George clothing available during the event including bodysuits, sleepsuits and pyjamas. 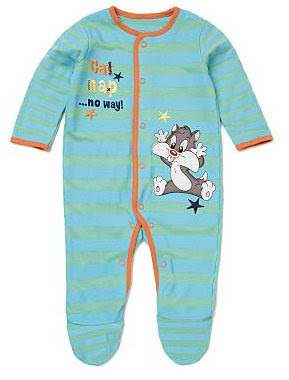 Over the last few years I have bought a number of clothes during the events for little man and I hope to pick up a very cute sleepsuit that is perfect for little man….the Looney Tunes Striped Baby Sleepsuit for £6 is super cute and the logo Cat Nap…. No Way describes little man perfectly. Even though we have baby and toddler essentials I will still be browsing an Asda store during the event in the hope of getting a couple of items we need for a great price. Pop along to your nearest Asda store or take a look on the Asda website to take advantage of the deals and discounts on offer during the event as there are many great products available that are perfect for parents-to-be to get items in preparation for the arrival of their baby/babies and for parents can save money on items they need for their babies and toddlers.